Dyson V10 Review - Is The Cyclone Absolute The Best One Yet? Dyson Cyclone V10 Absolute Review – The Best One Yet? Dyson’s Cyclone V10 Absolute is a premier technology vacuum cleaner. Armed with extended suction power, dual cleaning heads and an hour of constant buzzing, this powerful cord-free machine is the perfect companion for deep cleaning the house. It is versatile, packed with extra tools, designed to be lighter and engineered to last longer, with fewer trips to the rubbish bin. It is a high-end cordless vacuum cleaner that might take a toll on your budget, yet promises to be a long-term facilitator of a cleaner home. Read on to find out all of the features and benefits in this Dyson V10 review. Dimensions: 250mm x 1266mm x 256mm. Technology Highlight: Cyclone technology with a concentric setup of 14 cyclones. Filtration Mechanism: Whole machine filtration. Cleaner Head: 2 cleaner heads including direct drive and soft roller cleaner head. The Cyclone V10 Absolute has been carefully crafted to meet the needs of the technology-driven and fastidious consumer. 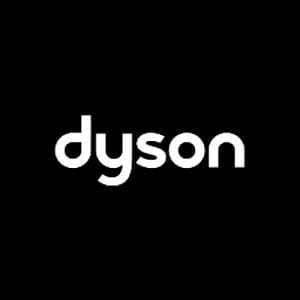 Dyson is one of the leading brands for household goods and its vacuum machines are among the signature products. 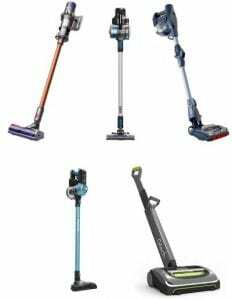 It has consistently upgraded its cleaning machine technology through the years, working its way around the concept of the handheld vacuum cleaner powered by a digital motor. This version of the cleaner is equipped with a tinier battery pack that lasts much longer. A complete hour of fade-free battery life makes it easy to deep clean the home in one session. The filtration mechanism has been enhanced and the warning signal lights up in case of an upcoming blockage. The bin has been expanded to a more spacious one and matched with an effective ejection tool that saves the trouble of getting the hands dirty. The new technology ensures that the tiniest particles are sucked in from any kind of surface. It works equally efficiently on carpets, sofas, tiles, concrete, wooden floors and kitchen floors. It is also extremely effective in picking up pet hair and would be a useful device for pet owners who struggle to keep their floors and carpets clean. The spinning brush and fluffy roller head are added features that can be used according to the surface and quality of dirt particles. This bold offering from Dyson combines the classiest features from earlier models with evolving cutting-edge innovations that make it different from the rest. Whether it is pet hair, debris, hidden dust or dirt, the powerful suction mechanism consistently cleans out the corners of the house without fading down. It runs on an efficient motor that can spin over 2,000 times per second. The motor has also been configured in a way that sits straight with the bin and suction tube. The whole-system filtration system ensures that 99.7% of particles are trapped and it expels the tiniest dirt particles to make the home sparkling clean and dust-free. It also captures and expels bacteria and pollen that you may not even be aware of till you notice the difference in the surface and the air at home. It operates on three different power modes that can be selected based on the floor material, the cleaning goal and the dirt quotient. The cyclone technology features 14 cyclones that generate enough power to catch microscopic elements and eject them into the bin. The linear alignment between the motor, bin and cyclone enables higher and precise suction power that draws dirt in swiftly and efficiently. The two cleaner heads are much more efficient than the earlier models and work together to catch the smallest dust particles. The carpets and sofa can be cleaned much more intensely and smoothly with this new technology. The Dyson Cyclone V10 features a pack of extra tools that make it fun and seamless to work with. The combination tools offer the flexibility of alternating between surfaces. The crevice tool reaches into narrow areas and sharp corners. The mini-motorised tool speedily ejects dust straight into the bin. It is noise-free and has extremely low sound levels. The acoustics are engineered to absorb the sound and make the machine effectively silent at work. I wouldn’t need to dirty my hands while ejecting the dust into the bin with the ‘point and shoot’ technology that makes the dirt land directly into the bin. This makes it more hygienic and convenient to use. It has up to 60 minutes of fade-free power that enables complete home cleaning in one session. It also sports a mini soft dusting brush for gentle suction-free cleaning and dusting. This is quite effective on screens and other sensitive surfaces. It neatly fits into the accompanying wall-mounted dock. 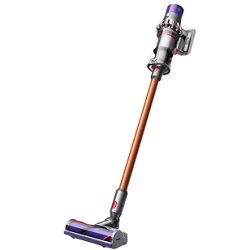 The tools enclose quickly and the vacuum does not take up too much space when it is recharging. In one click, it magically transforms into a handheld cleaner, making it easy to reach low and far spaces and corners. It changes back into its default mode just as easily. It has a large-sized bin and enables easy emptying and cleaning. It is expensive and requires thoughtful investment. It lasts on only one battery. 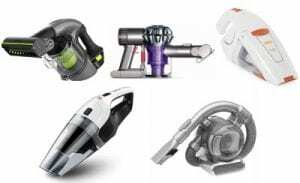 Dyson is known for its range of vacuum cleaners. The Cyclone V10 is stylish, sophisticated, efficient and brings the zing back into daily chores. Though priced highly, it promises an enriching cleaning experience and is among the best cordless cleaners in the market today. Enhanced suction power, additional tools, strong battery life and soundless execution make it a product with flair. It is designed to amaze and engineered to suit the busy user who loves a bit of experiment and exploration. It is one of those expensive machines that I would not immediately be convinced to buy, yet when I see this beautifully crafted wonder at work, it makes the investment worth it. Dyson’s Cyclone V10 Absolute brings vigour and vitality to mundane home cleaning, making it an exciting experience.